I am writing about a dead simple and reliable sandbox escape exploit which only have one line of code. Yeah I am sure it’s an exploit, not just PoC. It has nothing to do with iOS so please stop asking me anything about that. The bug was refactored (and killed) before beta release of Mojave. The latest vulnerable version is macOS High Sierra 10.13.6 (17G65). This line will generate a new plist under ~/Library/LaunchAgents. With the proper arguments you can launch a Calculator or anything you like after re-logging into system. What the hell? Isn’t writing plist supposed to be blocked by sandbox? The key is that there’s a TOCTOU incfprefsd that you don’t even need to race. There are Preferences Utilities in CoreFoundation for reading and saving plist serialized preferences on macOS. Most developers are in favor of NSUserDefaults. They are similar for reading and setting serialized key value data, but NSUserDefaults is designed for containerized environment (like apps from App Store), while Preferences Utilities has an explicit argument for accessing data from other applications. The applicationID argument can also be an absolute path, if the app has the access permission. Now the question is, why giving the path outside sandbox it still works? These functions internally invoke inter process communication via XPC with cfprefsd, as implemented in CoreFoundation. The daemon surely will check the sandbox state of incoming message, with sandbox_check. The TOCTOU is about mistakenly cache the result of sandbox_check from the beginning, and keep trusting it during the whole session. 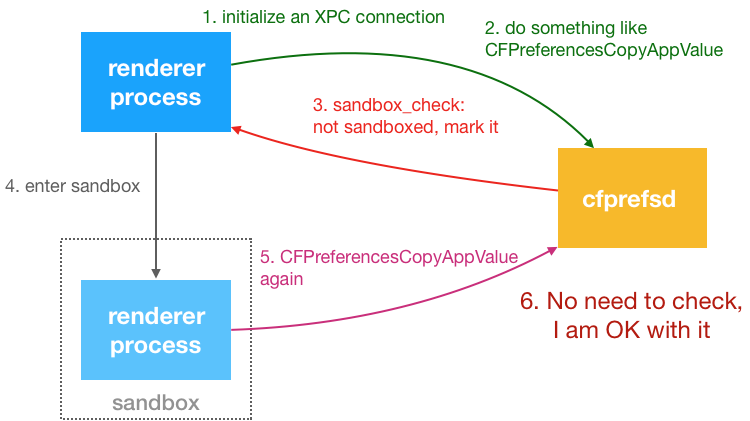 When a process first initiates an XPC connection with cfprefsd, its sandbox state is checked with sandbox_check function. The result is cached for the duration of this XPC session. Thus, new CFPreference operations are still allowed by cfprefsd after sandbox lockdown because of this cached result. 2019–03–14 07:47:08.347 a.out[1026:33710] after: 10.13, Copyright © 2001–2017, Apple Inc.
As we see, if a process has accessed CFPreferences utilities before it goes into sandbox state, there will be no further sandbox check. Let’s take a look at WebKit’s sandbox implementation. WebKit has a multi-process architecture, so it needs to spawn the process before containerization. At the very beginning of the renderer process creation, it’s just a normal process. After the initialization, it calls ChildProcess::initializeSandbox to enter sandbox and load untrusted content. So cfprefsd will always treat it like a normal process. LaunchAgent requires logging off, so I digged around and found another way to trigger the code execution outside instantly. Well this instant trigger actually has nearly 80 lines of code (make it clear in case of the criticize for the title). Here’s the live demo chained with WebSQL renderer exploit from Pwn2Own 2017 (credit to Slipper & Kelwin). Don’t have a working renderer exploit on High Sierra so I use the old one. This bug affects at least from El Capitan to High Sierra (10.13.6), or maybe even earlier version. No CVE assigned but I think it’s worth branding.